While most other fighting game pros are still catching up on sleep after Evo 2018 last weekend, Super Smash Brothers players keep the party train rolling this weekend with Super Smash Con. The rivalries between these longtime players burn just as bright as they did last weekend. Smash 4 players Leonardo “MkLeo” Lopez and Gavin “Tweek” Dempsey both missed Evo this year. At Super Smash Con, they’ll have the chance to duke it out against Evo winner Tamim “Lima” Omary and runner-up Zack “CaptainZack” Lauth, both of whom got booed for their Bayonetta plays on the Evo stage. Meanwhile, after toppling the “gods” of Melee and earning the top prize on the Evo stage, William “Leffen” Hjelte has a title to defend. He’s been posting all morning about feeling sick, though, so perhaps Adam “Armada” Lindgren can prove he deserves that “god” status. Armada also posted about the wear and tear that this month’s Smash majors have taken, so if anyone else wants to topple a god in pools, this could be your moment. They’re all very tired. 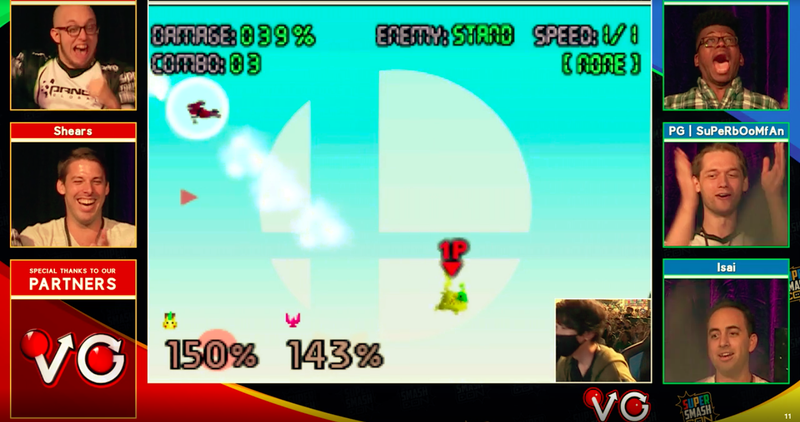 Super Smash Con’s competitions already started last night with the Combo Contest, won for the third year in a row by Prince Yoshi with this stunning Red Shell-centric Yoshi maneuver. Smash competition pools stream all day today and tomorrow on Twitch via the channels VGBootcamp, VGBootcamp2, SSB64 and SmashStudios; here’s a link to the schedule. Smash Brawl’s Top 6 airs tomorrow at noon ET, with Smash 64 finals at 6 pm. This Sunday, Smash 4 finals air at 3 pm, followed by Melee finals at 6 pm. Over at the Riot Games Twitch channel, the North American League Championship Series enters its eighth week, with Team Liquid in top standing, followed by 100 Thieves and Echo Fox. Those last two teams will face off first this weekend (tomorrow at 6 pm ET), thereby determining which rival Liquid should most fear. They probably won’t feel scared either way, though, given their five-game win streak this summer. The Team Liquid powerhouse goes up against OpTic Gaming on Saturday and Cloud9 on Sunday; the rest of the match lineup is on the League esports website. The Heroes Global Championship kicks off its Western Clash this weekend, featuring eight teams of relatively similar standing, so it’s anyone’s guess as to which teams will rise to the top. Team Dignitas and HeroesHearth Esports both entered this event without a single loss under their belts, and Dignitas just beat Team Octalysis 2-0 in their first match today. Catch the rest here. Speaking of Dignitas dominance, the Dignitas PUBG team just earned the top slot in the first day of competition in the grand finals of Global Loot’s second season, narrowly edging out Wildcard Gaming by a mere 10 points. Tomorrow, the grand finals continue at 9 am ET on Global Loot’s Twitch. There are only six games down and 12 more to go before the top team takes the trophy this weekend. If that’s not enough PUBG for you, the Broadcaster Royale invitational also has its regional finals all weekend long. The North America final starts tomorrow at 3 pm ET, followed by Europe, Asia, and South America’s regional finals, airing here. Tomorrow, the North American open qualifiers for the sixth season of the Rocket League Championship Series begin at 1 pm ET, with the first day of Europe’s qualifiers starting on Sunday at 7 am. Rocket League’s Twitch channel is already airing some qualifying matches right now, but those are for a totally different competition: the Rocket League Universal Open, hosted by FACEIT and NBC Sports. That Rocket League channel will switch over to airing the Championship Series tomorrow; if you want to watch the Universal Open’s West Regional Finals that same day, head to the FACEIT Twitch channel at 2 pm ET. Summer Skirmish enters its fifth week tonight, with more games continuing tomorrow at 1 pm ET via Fortnite’s Twitch. After a rocky start, Epic Games has been experimenting with the rules for these events, and this week they’re trying a new format. An elimination earns a point for your team, but if you get a Victory Royale, eliminations will be worth three points in the next round. The team with the most points after eight matches wins. The three-point increase after a Victory Royale should motivate players to stay aggressive, even if they’re already in the lead, rather than hiding and avoiding combat, which can make Fortnite very boring to watch. If this format works, Summer Skirmish could get a lot more fun. This weekend, QuakeCon hosts a couple of esports tournaments, such as the The Elder Scrolls: Legends Masters Series Championships, currently airing its finals here. Tomorrow, the Quake Champions QuakeCon Open will air 2v2 matches on the Quake Twitch channel, working up to the finals at 6:30 pm ET. On Sunday, the Quake Twitch will show the 1v1 Duel Showdown, with the finals airing at 5:30 pm ET.